The World Alliance for Low Carbon Cities, together with Tsinghua University and Kyoto University will host a symposium on water treatment technologies and practices in Shenzhen, China tomorrow, Saturday the 13th of December, 2014. The symposium will feature presentations from a wide variety of visiting experts active in the research, development, and commercialization of related technologies and solutions. Among the presenters is Shenzhen Yuekunlun Environment, a valued WALCC member, who will lead a discussion on deep environment treatment and secondary pollution control technology. Opening the symposium will be the chairman of the WALCC's board Professor Kang Feiyu, Dean of Tsinghua University's Graduate School at Shenzhen. The Alliance's vice-chairman Johan Wallin of Synocus, will also attend the symposium. In addition to these valued participants and speakers, the Alliance is also pleased to welcome the the following participants who received a special invitation from the Alliance: Prof. Kap Seung YANG, School of Polymer Science and Engineering, Chonnam National University; Xu, H., Vice-General Manager, China Everbright International Limited; Wang, L., Vice President, Kangda International; Chen, L., Chairman, Litree Corp.; Pan, K., Qingke Zijin Environment Technology; and Prof. Wang, P., Hunan Xilin Environment Material. For a full schedule and further information on the symposium please see the event page. 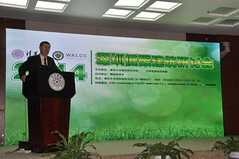 The December newsletter includes reports on the December 13th water symposium held in Shenzhen, China organized by the World Alliance for Low Carbon Cities together with Tsinghua University and the University of Kyoto as well as details regarding WALCC vice-chairman Johan Wallin's visit to Bosum Association during his trip to China. Read our latest newsletter for a preview of the upcoming Shenzhen Forum this June and a report on Harvard President Drew Faust's lecture on Chinese-Western partnerships at Tsinghua University on March 17th. A workshop held in Finland last week, as part of the Systemic Architectures for Sustainable Urban Innovation (SASUI) project, addressed one of the most pressing challenges in low-carbon city development, the formation of collaborative partnerships between the public and private sectors as well as the public. The workshop was held over two days (Thursday, February 5th and Friday, February 6th) in Tampere and Espoo, Finland. Hosted together by members of the SASUI project (Aalto University, the University of Tampere, and Synocus). The workshop included a visit to Tampere, hosted by the University of Tampere, which introduced the participating group of visiting researchers, from Belgium, Italy, Sweden, and China, to an ongoing urban development project in the city, the Tammela project. Researchers from the University of Tampere were joined by Minna Seppänen from the City of Tampere’s Planning department in presenting the ongoing development and the partnerships and collaborative networks involved. On Friday the workshop moved to Aalto University’s Urban Mill in Espoo where the day’s presentations addressed three core themes, moving from urban living labs to systemic capability building for urban transition, the role of the local government and national frameworks in supporting innovativeness towards low-carbon urban development, and enabling public-private-people partnerships in urban planning and development with sensitivity to institutional/systemic constraints. The group of visiting researchers reflected the SASUI project’s global perspective on the development of architectures for urban innovation, including participants from Belgium (Annette Kuhk, KU Leuven), Italy (Grazia Concilio & Emma Puerari, Politecnico di Milano), Sweden (Peter Parker, Malmö University), as well as Ben Chiang from Tsinghua University’s Shenzhen Graduate School who joined the workshop as a representative of the World Alliance for Low Carbon Cities and discussed his ongoing research on Shenzhen’s traffic system. The two-day workshop provided the SASUI project’s contributing researchers with an opportunity to share perspectives on the development of new forms of collaboration and partnership in urban development and city planning, offering a truly global perspective on the various approaches to this important aspect of sustainable urban development. Read more about the SASUI project and the City of Tampere’s Tammela ubran infill project. The 7th Low Carbon City Development World Forum was successfully held in Tampere, Finland. Under the theme ”Systemic Transitions Towards Low-Carbon”, the forum addressed, through vibrant discussions, topics such as Systemic Architectures for Sustainable Urban Development (SASUI), smart mobility, revamping urban districts, industrial symbiosis, built environment, Internet of Things, and green hospitals. To create more opportunities for communication and cooperation among the member organizations, the Graduate School at Shenzhen, Tsinghua University together with the World Alliance for Low Carbon Cites (WALCC) decided to host an event titled “Shenzhen Low-carbon Building Seminar” to continue the dialogue under this specific topic. We have the honor to invite Dr. MAO Daqing, the Senior Vice President of Vanke Group, General Manager of Vanke Beijing, to give a keynote speech on green building topic. Meanwhile, we are glad to announce that Dr. MAO Daqing will become the adjunct research fellow at the Graduate School at Shenzhen, Tsinghua University, and be elected as a Board Member of the WALCC. Schneider Electric, KONE, Shenzhen Airport, and the Shenzhen Institute of Building Research will have senior representatives to share their opinions on green building with the seminar participants. Below is the preliminary schedule. Fill out the registration form. Registration will be confirmed by email. Hosted in cooperation with Tsinghua University and Kyoto University, the symposium is focused on the challenges associated with water issues in Asia and the latest technologies and best practices to tackle these challenges. It features a full day of presentations and poster sessions as well as networking opportunities throughout the day. The symposium is an opportunity for academics and industry members to exchange the latest innovation technologies and promote technology transfer and cooperation globally and to network with professionals and academics in the water field. Chen, L., Chairman, Litree Corp. The Tsinghua University Graduate School at Shenzhen and the University of California at Berkeley have announced the founding of a new research institute in Shenzhen. The institute will be focused on developing solutions to social needs and global challenges in three areas: nanotechnology and nanomedicine, low-carbon and new energy technologies, and data science and the next-generation Internet. The institute is set to open to doctoral students in early 2015 and master’s students in 2016. The institute will be staffed by faculty from the two universities as well as recruiting leading researchers in innovative, cutting-edge research projects which give students an opportunity to take part. The institute will support the further integration of the two universities’ activities and provide students with increased opportunities to participate in new research. 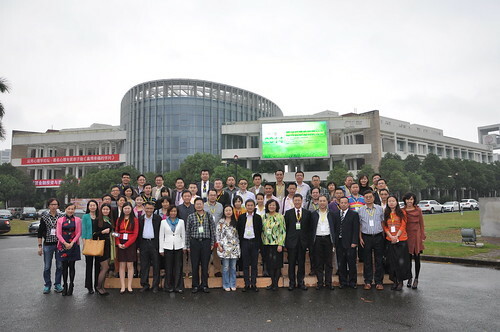 Tsinghua University’s Graduate School at Shenzhen and the World Alliance for Low-Carbon Cities organized a low-carbon building seminar in Shenzhen, China on November 8, 2014. The seminar was very successful in bringing together a number of corporate and public sector participants active in low-carbon industries. Topics of discussion at the seminar included building materials, construction process, and carbon emissions in construction as well as the great potential for carbon reduction in urban development. Presentations addressed a variety of topics under the theme of green, sustainable construction. Dr. MAO Daqing, Senior Vice President of Vanke Group, spoke about applying green and low-carbon practices to real estate development. Dr. Mao spoke about how Vanke’s commitment to exploring technology and policy innovations helps the company to improve the lives of their customers through the investing in improving the quality of construction and resource efficiency, as well as establishing community waste management and environmental education programs. Alongside these developments Vanke is also involved in the development of the planned Beijing Green Building Park. Mr. WU Xin of Schneider Electric’s Eco-Building Business Unit gave a detailed report about the dramatic rise in return on investment (10- 20%) in the company’s green buildings, based on resource efficiency and customers’ positive experiences. Mr. Wu introduced a variety of green building activities which had helped the company develop their green building properties, particularly focused on employing energy efficiency solutions. Mr. YANG Lihua, National Key Account General Manager in Schneider Electric’s Retail Business Unit, and Mr. Jason Chen, Key Account Manager at Schneider Electric’s Retail Business Unit, traveled from Beijing and Guangzhou respectively, especially to attend the seminar. Schneider Electric’s participation at the seminar brought a valuable perspective on improving productivity when adopting energy-efficient green solutions. Dr. Emma Falck and Mr. CHEN Bin, Senior Product Marketing Manager of Kone’s Product Strategy & Marketing Division, presented energy-conservation technologies commonly used in green building elevator and escalator fields, and their application in successful cases, including the Kingdom Tower presently under construction in Saudi Arabia which is set to become the world's tallest building, and in MonoSpace elevators and energy-efficient designs. Mr. YANG Haibin, Vice General Manager of the Shenzhen Airport (Group) Co., Ltd, shared experiences from the Shenzhen Green Airport, including practical application of T3, photovoltaic energy conservation, and rainwater recycling technologies as well as other very energy-efficient, green strategies. Prof. YE Qing, Managing Director of Shenzhen Institute of Building Research Co., Ltd, presented a green building design strategy developed for the new urbanization context, and participants shared examples of efficient, practical, and feasible low-carbon buildings in use in Shenzhen. In addition to these presentations, participants and speakers engaged in lively discussion throughout the seminar, providing an opportunity to explore areas of interest more thoroughly with the experts present. In his concluding remarks, Chairman of WALCC, Prof. KANG shared his aspirations for this seminar to, not only increase awareness regarding building energy consumption, low-carbon buildings, and green buildings, but also to promote cooperation and joint development of low-carbon buildings. Guests attending the forum included the vice-president of the China Research Centre of Landscape Architectural design and Planning and former vice director of the International Cooperation Department of the Ministry of Housing and Urban-Rural Development of the PRC Miss ZHENG Shuling, Tsinghua University, Shenzhen Graduate School Dean and Professor KANG Feiyu, the World Alliance for Low Carbon Cities Chairman who gave the opening address at the forum. Dr. MAO Daqing, Senior Vice President of Vanke Group, Mr. Wu Xin of the Eco-Building Business Unit at Schneider Electric, Asia Pacific regional president of new equipment Dr. Emma Falck at KONE, the Vice General Manager of the Shenzhen Airport (Group) Co., Ltd. Mr. Yang Haibin, and Prof. YE Qing, Managing Director of Shenzhen Institute of Building Research Co., Ltd. who delivered a key-note speech. Furthermore, participants also included members of the World Alliance for Low Carbon Cities, Tsinghua Alumni Association, members of the Shenzhen Bosum Association, graduate students and faculty, a total of about 140 people attended the forum. See photos from the forum here. Building on the successful results of the recent Low-Carbon City Development World Forum held in Tampere, the World Alliance for Low Carbon Cities and Tsinghua University's Graduate School at Shenzhen will host a low-carbon building themed seminar in Shenzhen, China on November 8th, 2014 from 13:00 - 18:00. The Shenzhen Low-carbon Building Seminar will create more opportunities for communication and cooperation among the member organizations in the interest of furthering the dialogue initiated at the Alliance's Tampere forum. The seminar will feature speeches from representatives of WALCC Diamond member organizations Vanke Group and Kone in addition to other WALCC member organizations such as Schneider Electric. News of an upcoming water treatment themed event will be announced here in the near future. For further details on the seminar and the list of featured speakers, see the event page and register for the event now!